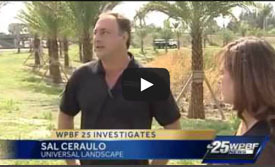 Monthly Specials - Universal Landscape, Inc.
All Material installed in these offers meet our regular warranties & require proper irrigation & care. Area of Offer : These prices are good for Martin, Palm Beach and central Broward Counties. While the majority of our work is with new or renovation landscapes, waterfalls or Resort Style Outdoor Entertainment areas, we also serve those who simply wish for us to help spruce up the property or add a new planted area with a few new items at times. The Monthly Specials listed here are greatly reduced for those who are looking to have a project done and provide increased savings on a few different types of materials & services. Some of the deals are discounted so greatly we had to include them as being a part with at least a minimum of other work being done. We always strive to provide excellence in our products, craftsmanship and service and below we hope you will get a good sense of how we also work hard to provide you with great deals and competitive pricing. Just fill out the form on the bottom of this page and specify the deal(s) you may be interested in to register for our discounted on-line pricing specials. 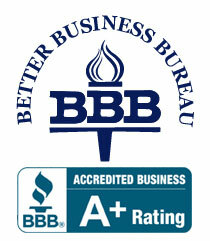 Call Today for a Free Consultation and Estimate, We will work hard to make you glad you did! 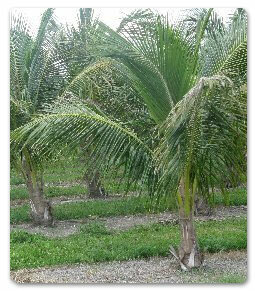 Green Malayan Coconut Palms ! 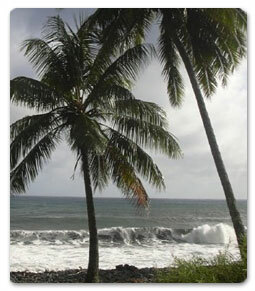 The Coconut Palm Tree, scientific name Cocos nucifera, is one of the most popular palms in the world. 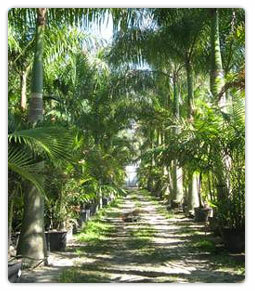 It is also known as Malayan Coconut Palm, Coconut Palm, Green Malayan Palm. It is native to the Malay Archipelago or the South Pacific. 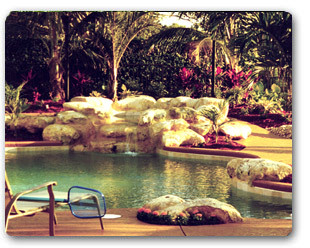 SPECIAL : 10’ – 12’ Green Malayan Coconuts INSTALLED for only $270 / each. Minimum orders of 3 or more. 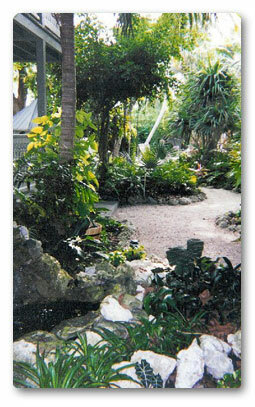 Call today for a great addition to a tropical landscape ! Great for privacy, fast growing to mature size, suit commercial or residential properties. 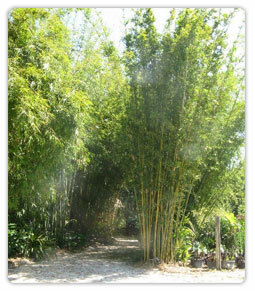 Bamboo are one of the most durable, cold hardy shade & screen barriers available in South Florida. The Bamboo on special offer here is the “Scranton’ Bamboo or known as Bambusa textillis Scranton. The second photo is the actual material and its current size as it is being offered, which will install at 6’ to 8’ tall. In 3 to 5 years with proper conditions and care this bamboo will grow to its mature size at 30’ to 40’ tall. For residential properties should be planted about 4’ to 6’ away from property lines, so there will be room if needed to trim any stalks from leaning over on a neighbor’s side. As viewed in the photo, they provide a dense, elegant screen and if planted by a walkway, an easy relaxing canopy to walk under, and beautiful when dressed up at night with lighting. Offer : installed at 6’ – 8’, 2 to 3 canes as in the photo to the left. Pricing : Quantity of 5 or more installed for $65 each. Quantity of 1 – 4 : installed for $80 each. Please Note : These Special Prices are offered when combined with any other landscape or project work of $650 or more. 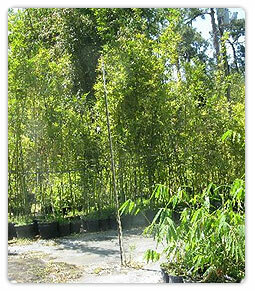 For Different Varieties or Larger Size Bamboos : We can provide a selection of hundreds of different varieties of bamboos, which come with a variety of different leaf styles, colors and some with very unique growth patterns. Beyond the many varieties and larger sizes available, for Commercial or Estate properties, we can also install at mature sizes. 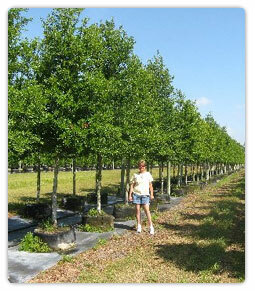 Live Oak Trees are one of the strongest, most cold hardy and great shade providers of N. America. 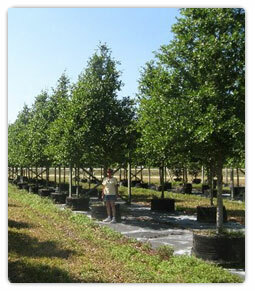 The trees in the offer here have been given a great deal of extra care in their growth, with added trimming attention to help ensure a strong, healthy canopy and are known in the industry as Cathedral cut. 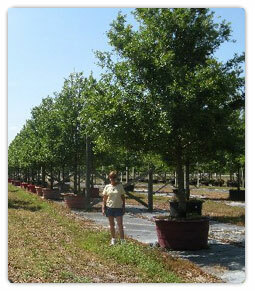 For this first offer A, this is the #30 Gallon Live Oak which has a 2.5″ caliper and will plant out at 10’ to 12’ Overall Height. Photo to the right is of the actual material and this size being offered. Quantity of 5 or more: $125 each Note : This offer for 4 or less quantities good when combined with any other landscape / project work of $650 or more. Offer B is the #45 Gal size which has a 3¼” caliper and will plant out at 12’ – 14’ Overall Height. Photo to the right is of the actual material and size being offered. 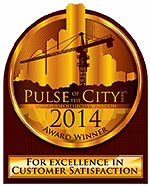 Note: This offer for 4 or less quantities good when combined with any other landscape / project work of $650 or more. This offer is the #100 Gal size which has a 4¼” caliper and will plant out at 16’ – 18’ Overall Height. Photo to the right is of the actual material and size being offered. 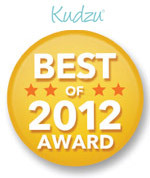 For quantities of 11 or more : contact us for pricing. For orders that are included with larger projects, further reduced pricing may be available. Offer D is the $200 Gal size which has a 6″ – 6 1/2″ caliper and will plant out at 20’ – 22’ Overall Height. 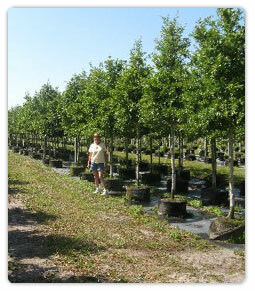 Note : As an extra measure to help ensure the health of these larger specimen trees, each tree of this size are installed with bubbler irrigation at the base of each tree (with existing irrigation) and will receive 2 fertilization & insecticide treatments in the first year of their installation, included in the per unit pricing. For the few deals that come with minimums ; what can you get starting with $650 ? From drainage work, to palm or shade trees, hedges, small plantings or freshening up an area of the yard with new flowers, rock or mulches – call today for your FREE CONSULTATION & ESTIMATE ! You may be surprised at the difference even a little bit of work in the yard can do ! 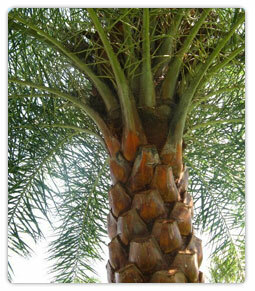 Phoenix Sylvestris or this variety known as Sylvester Robusta are a top choice for a strong, cold hardy palm. This robusta variety is more cold hardy than the regular Sylvester and can be planted as far north as South Carolina along our eastern Atlantic coast and withstand below freezing cold snaps. Great for accents or focal points with different settings and are commonly used for Residential Development Entrances, Hotels & Country Clubs, Commercial Buildings as well as stand out features in Residential landscape designs. Remember, these are the Sylvestris Robusta, and they have a thicker trunk, larger heads and more silver in color than the regular Sylvestris and usually cost about 35 % more than the regular Sylvestris. 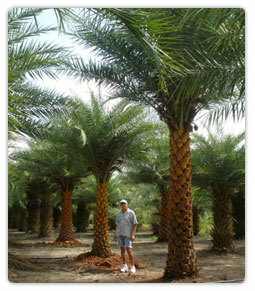 Specials: Call for special rates, all Sylvester Palms greatly reduced and prices determined by quantities and sizes that are ordered. Note: Photos to the left is of the actual material and size being offered. Larger sizes are available. For orders that are included with larger projects, further reduced pricing may be available. If you are interested in any of the specials offered here, have any questions on a different project that you may have in mind or are ready to talk to us in a FREE CONSULTATION about what may be possible at your property, you can fill out the form to register for these savings below or give us a call today, we will work hard to make you glad you did!